A Professional member is an employee of a public or private higher education institution or agency. An Associate member is a person who shares the purposes and goals of the Association, including public school administrators, teachers, and/or staff from pre-kinder to 12th grade. A Student member is a person enrolled in any public or private higher education institution. An Honorary member is an individual identified by the Executive Board who has performed a service which coincides with the Association's purpose or who retires while actively engaged in the field of higher education. Any faculty or student college organization affiliated with an Institutional member operating with a constitution approved by the Executive Board. The local chapter and/or student organization's goal is to advance the mission of TACHE and to provide leadership in local scholarship fundraising, mentoring, networking, and tutoring initiatives for higher education and public schools. An Institutional member is a public or private higher education institution or agency in the state of Texas that supports and furthers the goals of the Association. Institutional memberships include a certain number of professional and/or student members, depending on the level of institutional membership. To register online choose from our membership options here or go directly to individual or institutional membership registration. Institutional members are eligible to receive a 35% discount on The Registry annual subscription, a premier national database of diverse and qualified faculty. 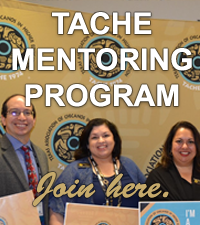 Institutional membership are eligible to post job announcements to the TACHE job board. Click for job posting guidelines.